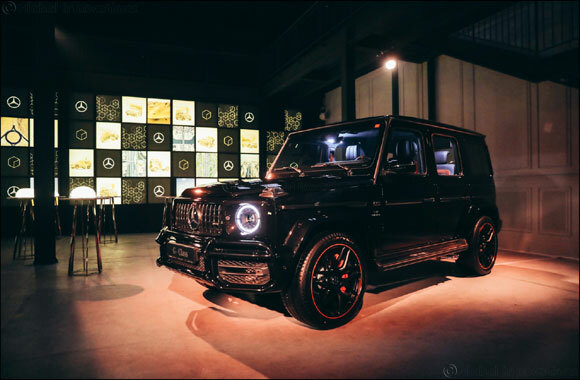 Dubai, UAE, July 05, 2018: The arrival of the new Mercedes-Benz G-Class was celebrated at Al Serkal Avenue in Dubai this week. The event introduced to the region the legendary flagship model – taking a leap into a new era in terms of technology while staying true to its unrivalled legacy. At the same time, the new suspension, the DYNAMIC SELECT driving modes including the “Desert” driving mode designed specifically for the G 500 in the Middle East, the 'G-Mode'- an intelligent off-road control system - and the three 100 percent differential locks enhance not only ride comfort but also agility – on any surface. Getting in the G-Class reveals that numerous design features from the exterior have been transposed into the interior: the shape of the round headlamps, for instance, which is reflected in the side air vents and the design of the iconic indicators, found again in the shape of the loudspeakers. Hallmarks of the model include the grab handle in front of the front passenger and the chrome-highlighted switches for the three differential locks; both have been meticulously optimised and retained as characteristic features. The very clearly arranged and completely redesigned instrument panel features timeless tube-look analogue round dials as standard - with two 12.3-inch displays blend visually into a Widescreen Cockpit beneath a shared glass cover. In other words, fans of classic round instruments will certainly not be disappointed in the new G Class. Drivers can choose between three different styles for the displays – 'Classic', 'Sport' and 'Progressive' – and also select relevant information and views according to their individual needs. The primary goal of development was to redefine the quality of the handling both on and off the road. This goal has been achieved: The new G-Class performs even better off-road, while on the road it is significantly more agile, dynamic and comfortable than its predecessor - thanks to its standard ladder-type frame, the three 100-percent differential locks and LOW RANGE off-road gear reduction. The specification for the G-Class not only included solidness and superiority in terrain, but also greater driving dynamics and comfort on paved roads. Thanks to the new front axle design, the on-road performance has therefore been enhanced at the same time. On the road, the 'G' is as agile as it is comfortable and provides the driver with a better steering feel. However, less mass in no way translates into less stability – on the contrary, it was possible to increase the torsional rigidity of the frame, body shell and body mounts by around 55 percent, from 6,537 to 10,162 Nm/deg. One of the prerequisites for the improved off-road handling characteristics is the new 'G-Mode'. The G-Class changes to 'G-Mode' independently of the chosen driving mode as soon as one of the three differential locks has been activated or the LOW RANGE off-road reduction gear has been engaged. This off-road mode adapts the adjustable damping of the chassis and the steering as well as the accelerator characteristic, avoids unnecessary gear shifts and thus ensures optimum control and maximum off-road capability. Drivers are able to enjoy inch-perfect manoeuvring even in the steepest terrain and receive excellent feedback on the traction capacity of the surface. For the transfer of power, the 9G TRONIC automatic transmission with torque converter was specifically adapted to meet the needs of the off-road icon. The developers have managed to reduce the shift and response times of the 9-speed transmission by means of a dedicated software application. The wide transmission ratio not only makes driving quieter and more comfortable especially at low engine speeds, it simultaneously also contributes to reducing fuel consumption. The new Mercedes-AMG G 63 underpins its unique position among performance off-road vehicles with the powerful drive system, the newly developed AMG RIDE CONTROL suspension, the AMG-specific transmission modes and new interior with optimal widescreen cockpit. The AMG 4.0-litre V8 biturbo engine now also replaces the previous 5.5-litre V8 biturbo engine in the G 63. It generates 430 kW (585 hp) in this model and delivers a maximum torque of 850 Nm. This is available across a wide rev range between 2.500 and 3.500 rpm, providing a sense of effortless superiority. It absolves a sprint from zero to 100 km/h in 4.5 seconds. The eight-cylinder delivers its power with muscular torque in all engine speed ranges, combined with maximum efficiency for low fuel consumption and emission figures. Unmistakable design features give the new AMG G 63 its unique appearance: the boxy silhouette, the proud bonnet, external door hinges, round headlamps, mounted direction indicators, robust door handles, muscular protective strips with inserts in high-gloss black with a silver AMG emblem, the exposed spare wheel on the rear door with a stainless-steel cover and three-dimensional Mercedes star. The front section of the G 63 is characterised by the AMG-specific radiator grille and the AMG bumper with large side air inlets and trim in matt iridium silver. The headlamps, indicators and tail lights are in LED High Performance technology as standard. The new G 63 performs even better when off-road, and on the road, it is more dynamic and comfortable than its predecessor. The agile driving impression is substantial due to the suspension system, which has been completely redesigned by Mercedes-AMG and features coil springs all-round. For the first time the front axle has an independent, double wishbone suspension; a rigid axle with a five-link suspension is used at the rear. The AMG RIDE CONTROL suspension with adaptive adjustable damping is standard equipment. This fully automatic, electronically controlled system adjusts the damping at each wheel to the current requirements, improving driving safety and ride comfort. Via a switch on the centre console, the driver can choose between three different sets of damping characteristics, namely 'Comfort', 'Sport' and 'Sport+', and thus individually influence the driving experience from very comfortable to taut and sporty. With the five DYNAMIC SELECT on-road modes 'Slippery', 'Comfort', 'Sport', 'Sport+' and 'Individual', the characteristics range from efficient and comfortable to very sporty and 'M' button to switch directly to manual mode. Three off-road modes - 'Sand', 'Trail' and 'Rock' - are available when driving off the beaten track. These can then be selected with the DYNAMIC SELECT rocker switch. 'Trail' allows maximum performance on soft, muddy or slippery surfaces. 'Sand' modifies the parameters for sporty dynamics and the best possible grip and steerability on sandy stretches or desert sand dunes. 'Rock' is the mode for extremely demanding, rocky terrain with severe axle articulation and frequent lifting of one or more wheels. For more efficiency, Mercedes-AMG has equipped the V8 engine in the G 63 with the AMG Cylinder Management cylinder deactivation system. In the partial-load range, cylinders two, three, five and eight are deactivated, which significantly lowers fuel consumption. The AMG main menu on the instrument cluster informs the driver whether the cylinder deactivation system is in use and whether the engine is operating in the partial or full-load range. The AMG SPEEDSHIFT TCT 9G transmission is used in the G 63. This has a model-specific software application to achieve very short shift times. The multiple downshift function allows more spontaneous bursts of speed, while the double-declutching function in 'Sport' and 'Sport Plus' transmission modes make for an even more emotional driving experience. Defined engine manipulation makes for even faster gear changes. 'Manual' mode can be selected using a separate switch. The gear changes are based on the selected transmission mode, and the driver can now change gear using paddles on the steering wheel. Moreover, the transmission stays in the selected gear and does not automatically shift up when the engine speed reaches the limit.